This is literally one of the best surprises you can receive in the mail. I present to you: The Vegan Kind. You may remember many, many posts ago, I posted a review of the very first Vegan Kind box; since then, the brand has flourished and is now one year old! TheVeganKind is a monthly subscription service just for vegans. 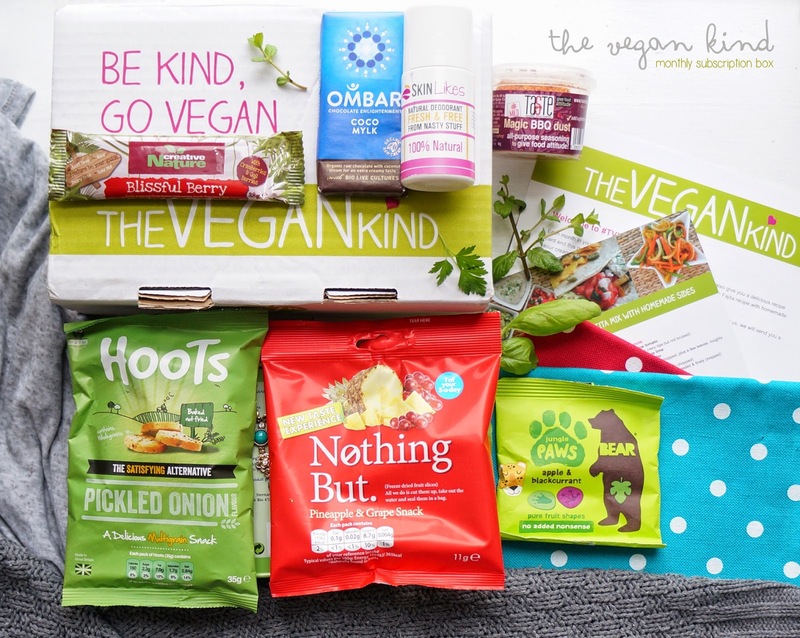 Unlike the other food delivery box services, TVK sends 5-8 vegan products from food and drink to beauty products to eco friendly household products! These are a complete surprise (as everyone loves surprises) and different every month; it's a great way to find new vegan brands that you may not have been able to find before (especially if you live in a low health/ vegan awareness zone like me)! Each box also comes with a recipe-of-the-month card (usually an ingredient of this is included in the box)! This was the last box I was sent (TVK #11) and I just loved every single product in it (especially the raw chocolate...SO good). Chocolate bar made using raw, organic cacao; this gives it such a rich, delicious and creamy flavour. A spice mix perfect for roasted veg, marinades/ rubs (over tofu) and mixed in with yoghurt. A roll-on natural plant-based deodorant which uses a mixture of therapeutic oils as the active ingredients in their odour stopping formula; no harsh chemicals! This has become my go-to deodorant; I love the smell, it lasts the whole day and its small enough to carry around in my bag! I'm already a BIG fan of these bars. They are 100% natural, raw, vegan and gluten + wheat free as well as being low in fat and containing no added sugar! Perfect for that mid-morning / mid-afternoon fruity energy burst! I'm usually not a big fan of freeze-dried fruit but this proved me so wrong! So crunchy and tasty and delicious! Unlike other dried fruits, Nothing But freeze-dried fruit retains its nutrients, natural colour and flavour. (Just a wee serving idea: these are great to use in oats if you are in a rush! Just add some hot water to instant oats and some of these, leave for a few minutes and enjoy)! Made from pure fruit with no added sugars or concentrates! An easy way to get one of your five-a-day on the go! Plus the little paw shapes are so cute! A deliciously crunchy and flavourful snack, Hoots are a great alternative to crisps! They contain wholegrain and mixed seeds with no added colours, flavours or preservatives and are also a great source of fibre! I will definitely be picking up these next time I see them in a shop (there are 5 flavours to try)! Each box is £10 (plus £3.15 postage and packaging) which I believe is a very good price for what you receive! The boxes each month are a complete surprise and totally different from the one before! TVK have also started up a quarterly vegan beauty box, something which I will definitely need to try soon! Currently, these boxes are available all over the UK and now in Europe too! Find out more about The Vegan Kind on their website and Facebook page (they also have a 25% discount-off code on their Facebook page just now too...definitely worth checking out)! have you tried TVK before? will you be going vegan this month?